Rural Revolution: Who IS this Marie Kondo, anyway? 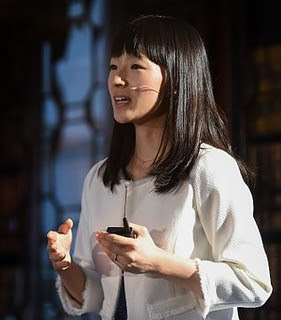 Since I've been "spring" (winter) cleaning the house and eradicating the unnecessary, I stumbled across someone named Marie Kondo, a tiny and exquisitely beautiful Japanese woman who apparently has become some sort of de-cluttering guru. She's written some books which have become international sensations, such as The Life-Changing Magic of Tidying Up -- and yet I'd never heard of her before. The New York Times had a fairly comprehensive article on her from last year, and endless other information is available. Who IS this lady? Has anyone read her books or utilized her methods? In other words, what makes her different? I don't want to "tidy up" if it means getting rid of stuff. My solution is much easier; build more shelves. Thank you for your very wonderful reply. I think what makes her different is that her approach revolves around keeping only those things that make you feel positive or uplifted, excluding necessities. For example, I have a grungy old pair of gardening sneakers that I would toss if I didn't garden, but they serve a need. She and others have posted youtube videos. It's the first and only book you'll ever need. Absolutely spot on. I'm a diehard fan! The book was good, but your book, Simplicity Primer was better in my opinion. Her philosophy is to gather everything together and only keep what you love, picking each item up and then keeping or passing it on. Frankly you could do that with the items in place but the idea is to see how "much" stuff you have that you don't really need. I prefer the idea of simplifying your life until you find the balance between what you need and what you want to own. Books of course being the exception to every rule. I don't own a lot of books, a lot of books own me. LOL. She was a guest on the Ellen show. I'm sure that boosted her popularity. IDK if it's the same but Japanese industry (Toyota, in particular) long ago introduced the concepts of Kaizen (continuous improvement) and 5S (Sort, Set in order, Shine, Standardize and Sustain). Also referred to as Lean manufacturing, it takes some effort to establish but once in place it really works. Her method of rolling tee-shirts for example, instead of folding them is so simple and so easier to choose and see what you have. The drawer stays neater as well. Also older daughter (if she is in charge of dressing the kids) would find this very helpful. I read three chapters, I like how she folds things and organizes things, also her philosophy behind personal things, but so much of what I have is for the unknown that I could not ever even become close to being a minimalist. I read her book. She's quite aggressive about getting rid of nearly everything except the bare necessities. She also lays out a practical method for accomplishing this. Her ideas about the why behind her methods are not ideas I share but the book did make me think more about the stuff in my life. I'm working on a slow decluttering of certain areas of things but with an active home live (cooking, sewing, household projects) supplies and materials are things to keep around. Perhaps for more urban dwellers, they might need less stuff in their lives. It's also interesting to note that the Japanese to not buy "used" houses. The majority are new builds so there is no market for home improvement. Life is different over there. so...in Japan they are building contiually...they will cover the land at that rate! It sounds pretty bad to me! As I understand it, when someone "buys a house" they're really just interested in the land underneath it and they tear down the building and put up a new one. It also has a lot to do with constantly changing earthquake-protecting building techniques but that might be more marketing then anything. Japan has also experiences a low birthrate for quite a while now! I'm also a fan (to a point). One of her beliefs is that you shouldn't declutter/organize in dribs and drabs; but do it all at once & be done with it, forever. We went through our house with her ideas in mind & it has made a positive difference. Lots of difference of opinion about her methods. I haven't read her book though. I have my own methods and way of judging whether or not to keep or toss things. She is much more minimalist than I am too. Many people like her so it probably wouldn't hurt to borrow her book and read it to judge for yourself. Marie Kondo has been around for several years. She's written several books, some of which haven't been translated, became famous in Japan, had a tv show for a while, became internationally famous, and now licenses or certifies professional organizers all over the country & world - as long as they can afford to travel to her few, select training seminars. Along the way she married and had one, if not two, children. There is nothing particularly family-oriented in her books, because she wrote them as a single woman who could totally control her environment. I imagine some things have changed now that she has her own family. She's known for her "spark joy" approach of touching everything and her insistence that buying storage/organizers is a waste of money. The old "if you have to organize your stuff, you have too much stuff" line. Kondo also relentlessly advocates storing objects vertically, especially clothing: folding them into little rectangles that can then be "filed" in the drawer. There are tons of videos on youtube illustrating this. It doesn't seem that huge of a deal, but it does generally allow a person to put more, say, t-shirts in one drawer than could fit stacked and have them all be visible at once. Good for kids too. Some people object to her animism or anthropomorphism that comes through quite clearly. Those people usually fail to recognize that's a traditional element in Japanese culture (and she used to work at a Shinto shrine, so that's part of it) and really, if it bothers you that much, just ignore it. If she wants to think socks have feelings, and you don't, then agree to disagree and move on. There's a lot more in her books about how truly cleaning out your stuff/house, from top to bottom, handling everything, means facing your past and making peace with yourself - there's some letting go of emotional baggage that goes along with that. From what I've seen, many people respond to that element very positively, which is to say they realize they don't need to keep things from bad times or unhappy memories. If you read "Spark Joy" - her second book - she addresses more clearly the utilitarian objects, like screwdrivers, which may not spark joy for most people but are occasionally necessary. That's a good analysis of her book. I've read it a couple of times and her ideas do need to sink in over time while you ponder how it can relate to your situation. I agree with the comment that it is more difficult to utilize her Konmari method when you have kids and some areas of your home are out of your decluttering control. What I did take away from her book was (1) gather all like items together and declutter them at the same time that way you can see where the duplicates / what's missing items are (example: bedding. When you gather them all together, I can see quickly that I have too many sheet sets for full size beds and not enough for twin beds) (2) we declutter things we don't want or need, when we should really flip our thinking to "what items do we really need or want? not "what can we get rid of?" Wouldn't feel right to not have to search two hours for something I know I have, and then finding a bunch of stuff I forgot I have. Kinda like treasure hunt. Organized and uncluttered people are kinda strange LOLLO(L.
Thanks! I just ordered this book from the library. I used to live in Japan in the '70's and I truly enjoyed the minimalist approach most people had but that is because the population and culture there is different than the US. I couldn't live with what I saw other people dealing with on a daily basis. The Ravishing Mrs. TB has read at least part of the book and has done some of it. I believe, as with many things, that the underlying concept is good but different people's way of writing and executing appeal to different people. I guess I have a more simple approach: I ask myself that if the house burned down, would I spend money to replace that particular item? Or would it be a relief to have it gone? My wife could use the help. for sure! I keep threatening to bring in a roll-on-roll-off dumpster, a couple of beefy guys to give me a hand, and have us a REAL spring-cleaning party. ... Strange how uncomfortable that couch gets ... FWIW, a couple years ago we downsized to a house half the size, and as soon as we moved in she had one knee replaced, and then the other about 8 months later. Much hasn't been unpacked yet, and a lot is still sitting in a storage locker. I have found that Marie Kondo's method of clothing folding really is much more practical if you are a small woman, you get to my size and there is no making things small no matter how you fold it!! I have the mindset that says if I don't need something, a neighbor might. I have a hard time getting rid of possibly useful stuff. My first thought was, 'Who would actually buy Marie Kondo's books or attend her lectures?'. But then I had the same thought about people paying for bottled water. I have notoriously messy drawers. I have tried to use her clothes folding method....and it does work. Tidy little rows of undie soldiers. lol And I have managed to consistently fold all my towels in a certain manner and they do, in fact, fit in the space and look much better. However, it can be a bit of a pinch to make it a habit. But Marie would probably have a cow if she were to look into our pantries...at the stored, preserved food and all the equipment it takes to do that. A canner is a necessary tool, but I don't I've ever "touched and been in love with it". I bet she doesn't have extra oil lanterns in case the power goes out. So if that regard, her methods would not be practical. 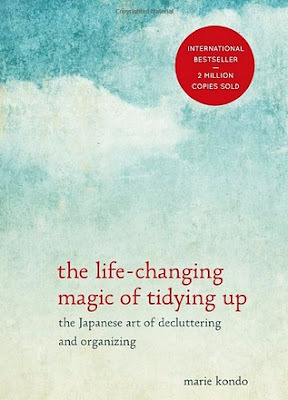 Clutter's Last Stand by Don Aslett covers every aspect of decluttering in a more practical way than Marie Kondo's book. It is also quite funny. Suburban life in Japan is very different to any kind of homesteading, self-sufficient lifestyle. Patrice, you often mention projects when you and Don use materials that you have found or been given and tucked away until needed. There is no concept of living like that at all in Marie Kondo's book. However, the message that we should not have so much stuff that we are overwhelmed by it is important and that we need to be discerning about what we do keep. Thanks, I will also be getting this from the library. She lost me when she suggested I thank my purse for its service before I empty and put it away every night. She lost me when she suggested that I thank my purse for its service as I empty and put it away every night.